Flash Freezing: Stop throwing away your money! 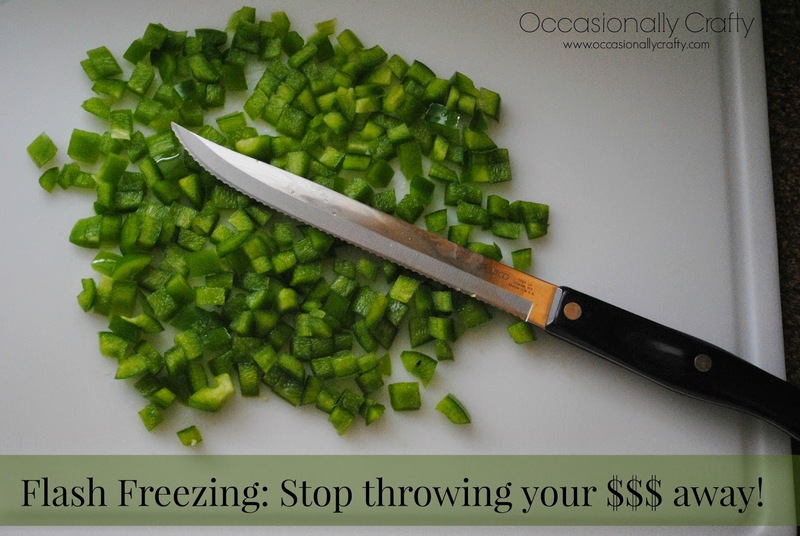 | Occasionally Crafty: Flash Freezing: Stop throwing away your money! Flash Freezing: Stop throwing away your money! While I don't profess to be the best as saving money, I do know that the easiest place to save money is with food! I'm hoping throughout the year to share a few tips that have helped me! Today I'm talking about flash freezing! Basically it's a way to save those vegetables from ending up in the garbage, along with the money you spent on them. Have you ever bought too many onions? Do you manage to use all of the green onions that come in one package? Maybe you do bountiful baskets, or garden and end up with more than can be eaten before it goes bad. Then it's time to chop and freeze! 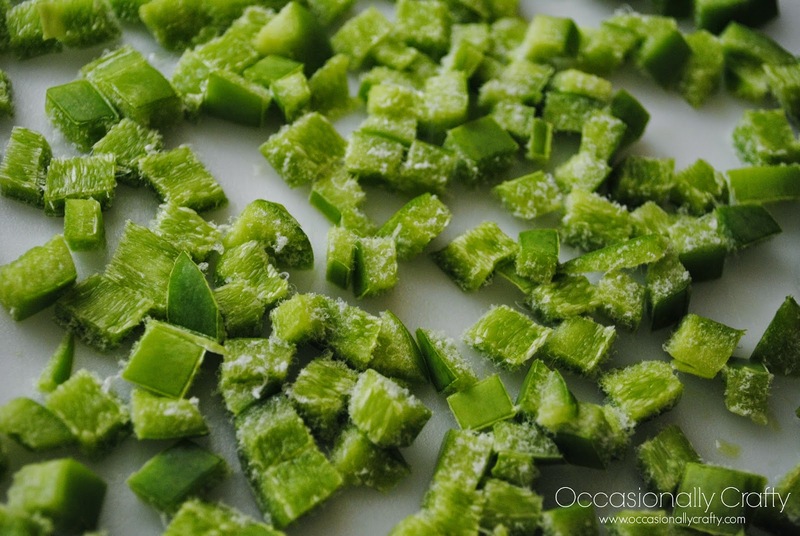 The point of this not to teach you to chop up veggies, or even how to stick them in a bag and freeze them, but if you want them to be usable once you need them again, flash freezing is your new friend! 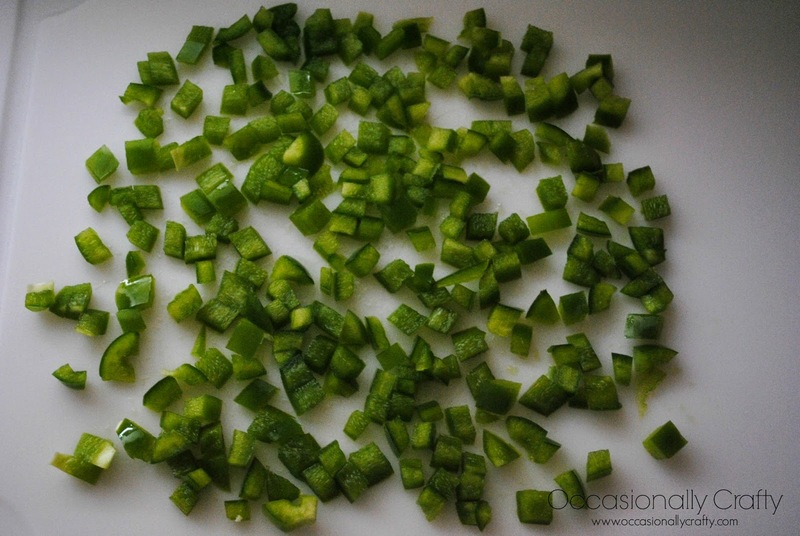 My photos are with green peppers so you can see the process clearly :) First: Chop your veggies and spread them out on a cutting board or cookie sheet. This will allow each piece to freeze individually. If you throw them all into a bag at this point, the moisture/juices from your food will freeze together, creating one big clump! Third: After a few hours your food will be frozen into individual pieces. 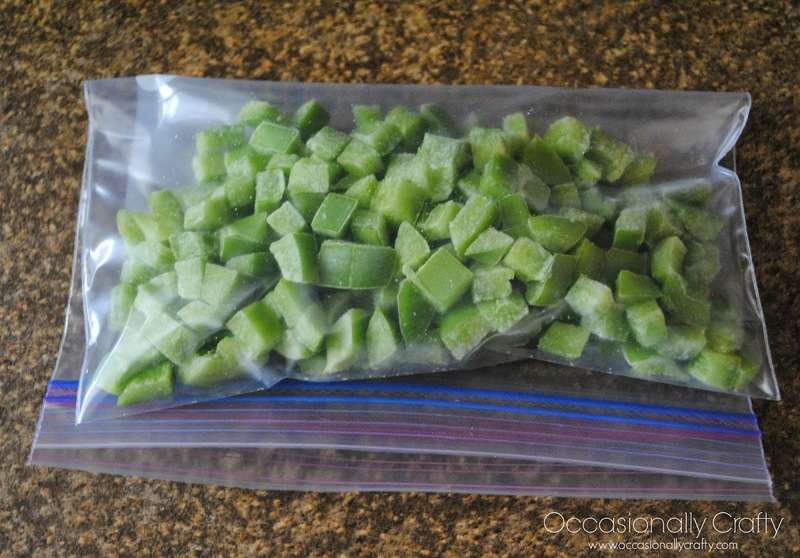 Last: Place in freezer bags and pull what you need out of it, instead of one big frozen clump of peppers! There are so many ways to utilize this skill to help save a few pennies here and there. I freeze peppers, onions, meat, bananas, the possibilities are endless! Now go look at your produce and see what you can save from the trash can! I'm shocked at how much my family wastes. It's really a shame. Thank you for the tips! Sure! Start small and see how it goes! I love to freeze produce to use later! I am getting ready to do that with red bell peppers tomorrow for fajitas! Awesome! Isn't it so helpful? Such a great tip! I'm terrible about wasting produce sometimes, I'm trying to get better and this is a good thing to try! Let me know how it goes! There's tons of lists out there of what's good to freeze. I even freeze butter! Great tip, thank you for sharing ! This is a great idea. Never thought about cutting the veggies into smaller pieces before freezing. Yes! Cut them how you'll use them again. Lots of recipes call for diced onions and peppers so this is perfect. I even freeze peppers and onions in strips for fajitas. 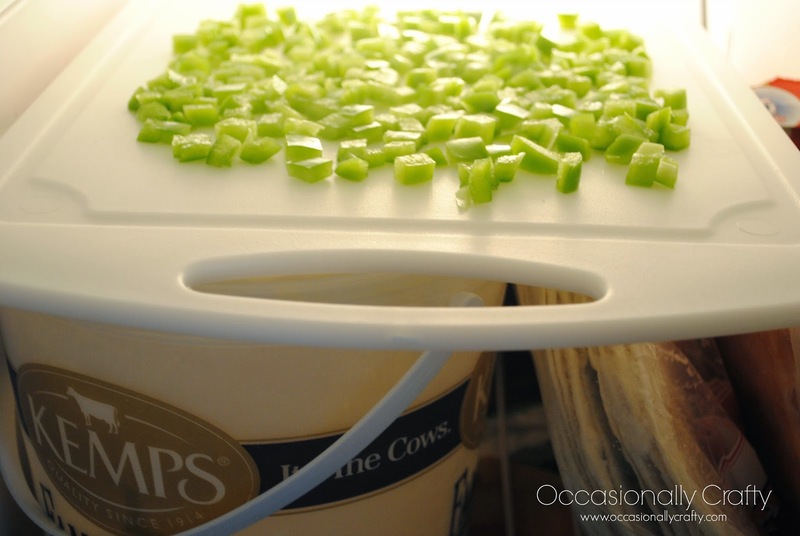 Woah, I never knew to chop first and then freeze, I always did it the opposite way and hated having to let it defrost! Now instead of buying less, buy what is on sale and freeze the rest! Less trips to the store saves tons of money too. brilliant! Just freeze your food! Thanks for coming by Lauryn! This is really awesome! I can tell you right now that I am the person who loses probably hundreds of dollars every year on this! I literally buy vegetables every week because of this. It's so annoying. So thanks so much for this. This post is amazing. I would have just put them in a bag in the freezer, so thanks so much for this info on placing them in the freezer first. I just preserved vegetables in the fridge, not chop up. Here you indicate 4 steps, I will try. Thank you for show me your tips, Laura McBride!